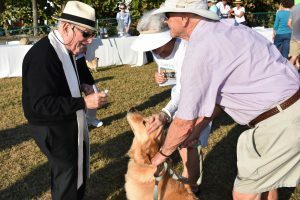 ■ The Ecumenical Blessing of the Animals was held last Thursday, Jan. 11 at the 7th Street soccer field. Shown above, Father Carosella from Our Lady of Mercy Catholic Church put in a good word for McKenzie, a golden retriever with good intentions but the occasional impure thought regarding the neighbor dog’s beef bones. Older PostKeep warm with some hot chowder!